The Scotia Arc is the name generally applied to the largely submarine physiographic feature that joins southern South America to the Antarctic Peninsula. More correctly called the Scotia Ridge, it consists of a system of submarine ridges and associated troughs, forming a loop that extends for 1500 km east from Tierra del Fuego and the tip of the Antarctic Peninsula into the South Atlantic Ocean (Fig. 1). The arc encloses the Scotia Sea just as the ridge/trench system of the Greater and Lesser Antilles encloses the Caribbean Sea. In fact, the islands of the South Sandwich Ridge, closing off the eastern end of the Scotia Arc, have frequently been referred to as the Southern Antilles. Like the Lesser Antilles they are volcanically active and are situated on the concave western side of an arcuate, seismically active trench. 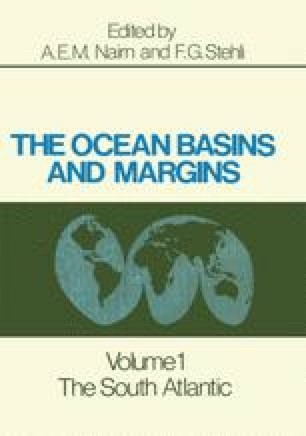 The physiography of the two arc systems is similar, except that the Caribbean Sea is closed to the west by the Central American isthmus and the associated Middle American Trench on the Pacific side (Fig. 2). Lamont-Doherty Geological Observatory of Columbia University Contribution No. 1946. Institute of Polar Studies, The Ohio State University Contribution No. 226. This field work has been supported by the U. S. National Science Foundation, Office of Polar Programs, under grants GA 4185, GA 12301, and GV 19543. Earlier work (by D. H. E.) in the Antarctic Peninsula was carried out under the auspices of the British Antarctic Survey.